All of the devices in this review - three of 'em - I purchased with my own cashy money. What follows is just my opinion. Y'all know about opinions, right? I'm just this guy, ya know... Your mileage may vary. The Noisy Cricket is a fully mechanical, series box mod. 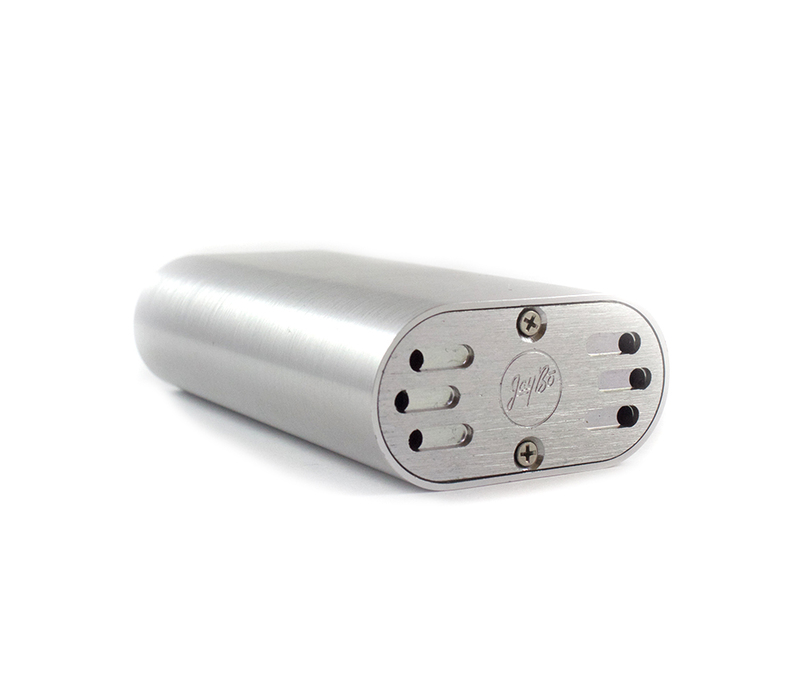 As such it has the potential to deliver up to 8.4 volts to an atomizer. Ladies and gents, that is a lot of volts! In a series mod, the voltage is doubled, but the mAh (runtime) and Amperage is the same as a single battery. Further, it is easy to get. Most brick and mortar shops have it in stock around the $30 mark, and I've seen it online for as low as $13. Of course, that price does not include the addition of a pair - married and matched - of really, really good high drain 18650 batteries. Add another $15 or so for those. Speaking of matching, it's also vital that the right atomizer is used with this device. The stock device uses a hybrid connector. For those not read up on 510 connectors, a hybrid connector is basically a disc of metal that is threaded into the body of the mod and has a threaded hole in the middle. The underside of that disc is non-conductive, or fitted with an insulator. 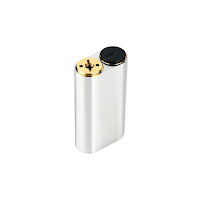 The positive pin of the atomizer makes a direct connection with the battery. 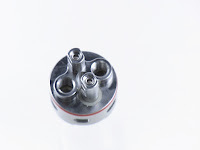 IF the positive pin on the atomizer does not protrude enough, or has a tendency to mash down or thread back into the 510 connector of the atomizer, then the positive pin in the center and the ground of the outer threads can make contact simultaneously, and BOOM! Hard shorts are very very very bad with high drain Lithium Ion batteries. They're not good with any battery, but not all batteries go BOOM and not all batteries are held up to a person's face. Before attaching any atomizer to a hybrid device, check the center pin over thoroughly. It MUST protrude from the threaded section, and it must NOT push back in or screw back in easily (reverse threaded 510 connectors are generally acceptable, but rare). Still on the subject of matching, the batteries MUST be matched and paired and married. This means they are identical in make and manufacture and purchased at the same time from the same location. They must be used at the same time, and charged at the same time. They must never be mixed and matched with another set or single. It is also a good practice to name and number them and rotate the battery under the atomizer each charge cycle (that battery takes a bit more of a hit in usage than the one farthest away from the atomizer). Those batteries MUST be installed in series. That is one battery will be positive down and the other will be positive up. The firing switch MUST be installed above the negative post, and the atomizer above the positive post. The switch and the hybrid connector are interchangeable - threaded identically - so care must be taken to ensure that they are installed properly. The switch does not have a safety or locked position. To prevent the device from firing when putting it away or in a pocket, I find it best to unscrew the atomizer or the switch a turn or two to prevent any accidental contact with the battery. I do not recommend carrying the device in a pants pocket. It's small enough to slip into a shirt pocket... carry it there, in hand, or not at all. The device is available in brushed aluminum (silver), brown, red, blue, black, and gray. It measures 79 x 40 x 22 mm. The hybrid connector generally sits flush in the body of the mod, and the button sets up a couple millimeters. That has already been accounted for in the listed measurements. The base of the mod is an oval panel secured by two screws. There are three vent holes set into three slots on either side of the Jaybo logo in the center of the base. The build quality of the device is quite nice, although - and this is true of any mechanical device - the threads and all other contacts should be cleaned fairly regularly. Failure to do so can lead to poor conductivity, crunchy threads, and sticky buttons. Unfortunately, this can mean disassembling the switch and the base of the unit. I never recommend disassembling any mod. Not only does it void any kind of warranty, but can create more problems than most consumers can solve. Speaking of the build, the coils (see what I did there?) have to be built to handle all those volts while staying safely within the amperage rating of the batteries. Knowing Ohm's Law is vital. I do not mean that it must be committed to memory and recited like a prayer or mantra when installing coils. It's perfectly acceptable to use an app on a phone or computer. But is is vital that the numbers be run before installing an atomizer. For instance, Samsung 25R batteries are rated to a max continuous discharge of 25 Amps. At 8.4 volts, the absolute lowest resistance build would be around .34 Ohms. Using Ohm's Law to derive the Amperage draw, we take the voltage divided by the resistance, or 8.4/.34=24.71. That is right at the limit of the battery. A lower build will overtax the battery. Again with the BOOM. I strongly recommend no builds lower than 0.4 Ohms. Even IF a battery claims to have a sustained Amperage rate of more than 30 Amps, the chances that the battery is either mislabeled or a little old or... well, it's just too big a chance to take with a person's face and fingers. This build really should be a chunky build. While it's possible to get exceed that 0.4 Ohms with a single, 1.5 mm inside diameter, 1 wrap, 34 gauge Kanthal A1 build, that would heat far to quickly and be potentially dangerous as well as seriously unpleasant. Instead, consider what I am currently running - a pair of 12 wrap, 24 gauge Kanthal A1, 3 mm I.D. coils coming in at a very comfortable 0.51 Ohms. The Noisy Cricket is inexpensive and powerful. For those reasons, it is also very popular. That scares me! I'm not alone, either. The vape shop I purchased this device at printed out a waiver of liability and I had to sign it before the purchase could take place. I liked that idea so much, I had it implemented at the vape shop I sometimes work at, but I took it a step further and included a rundown of the dos and don'ts of using the Noisy Cricket. Finish 9/10 - I can find no burs, and the materials are top notch, but there is a bit of a need to bevel the top and bottom edges. Form 9/10 - Although the device is small and comfy to hold (if those sharp top and bottom edges are avoided), I do really, really wish there were a locking feature on the switch. Function 10/10 - This device hits like a freight train loaded with bricks on a downhill grade with the throttle wide open and the brakes removed. Final 9.3/10 - Solid A. For the experienced vaper with a strong grasp of Ohm's Law, proper building techniques, and battery safety, this is an awesome device. I would not ever consider recommending this to a novice or intermediate vaper. This kit is genius, pure and simple! Fat Daddy has created a safer 510 connector with a knurled top that will allow the use of virtually any atomizer with the Noisy Cricket. The kit also comes with a larger button, also knurled. The addition of the knurling makes installing and removing the button and the atomizer much easier, much faster, and much safer. The kit doesn't stop there, though. The switch and the top cap are thoughtfully shipped installed in a gorgeous copper tube with cutouts for venting towards the base. This means that once the Noisy Cricket's components are removed and replaced, they can be used again in the tube as a hybrid tube mod. The price is just as sweet. I paid roughly $18, shipping included, to get this kit from FatDaddyVapes.com. 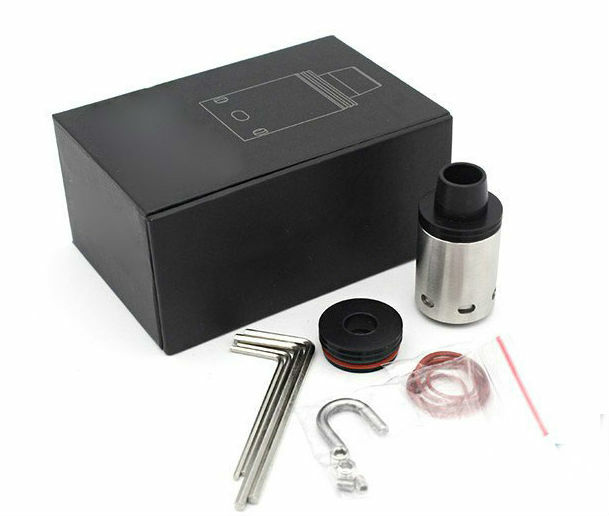 $18 for a mod that upgrades a mod? Outrageous, and worth twice the money, but I'm glad the price is where it is so more people can afford it. I was concerned when I ordered it that the safety of the tube mod would not be that great because of the touchiness of the stock Noisy Cricket switch. However, that issue was nicely dealt with by making the button recessed. Almost all of my concerns with the Noisy Cricket were addressed with this kit. The only thing I would like to see is a locking feature for the switch. I'm not even going to run through the pros and cons of this kit. I'm not going to give it a grade. 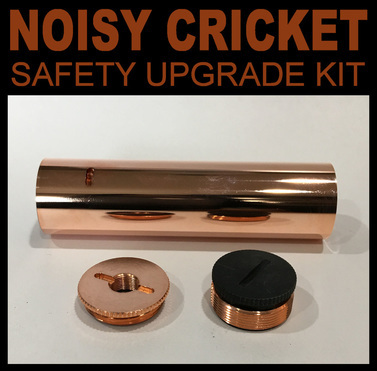 I'm just gonna say, in plain English, if you have or are considering getting a Noisy Cricket, GET THIS KIT! I did not want this RDA. I had some money burning a hole in my pocket and it was the only thing in the vape shop that day that I did not own (this either says something about my collection or about the vape shop... not sure which), so... Mine is a very nicely done clone. I paid too much as I was supporting the local B&M, but I've seen it online for as low as $13. The authentic runs around $65. Once I bought it, I did not want to like it. The post configuration is wrong, the airflow is wrong, the deck is wrong, the topcap is wrong. It's all wrong. The top of the RDA is a Delrin wide bore cap that is held in place with a single o-ring. 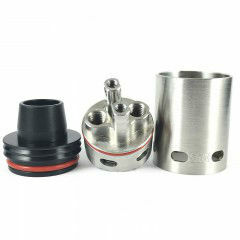 The inner diameter of the cap is a comfortable 10 mm. Beneath that cap is a rather tallish barrel with six oval air holes close to the base. On the bottom of the barrel (hmmm... that doesn't sound right), there are two inward facing flanges, or tabs, facing inwards. There's a small etching of the company logo between two of the air holes, and that's the only visible branding on the device. 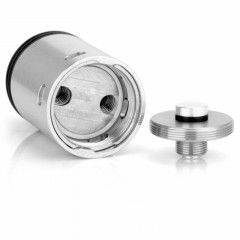 The RDA, when assembled, measures 30.6 mm from the base to the top of the cap not including the mouthpiece which - if the 510 adapter is not used instead - is integrated and adds another 10 mm to the height. It's 22 mm in diameter (although there is now a 24 mm variety available). The deck consists of two beefy posts set rather close with almost as much space between the inside of the barrel and the posts themselves. These posts each have a single large hole for trapping big wires or builds. The hex grub screw is on top. Between the sides of the air holes and the posts are slots for wicking. Honestly, the deck looks more like the deck of the Youde Goliath than any other RDA out there. The RDA comes with a thick stainless steel U staple looking tool, and there are two holes in the bottom of the deck that this fits into. The deck comes apart into two pieces with the deck proper sitting on an inverted cup with cutouts matching the air holes on the barrel, and the base and removable 510 center pin. This comes apart so that contacts can be cleaned. Nice. Also on the bottom of the deck are two grooves. These grooves match up with the tabs on the barrel and allow both for adjustment of the airflow, and tightening and loosening of the atomizer from the device. The 510 connector features a VERY protrudy center pin. That, when all is said and done, is really the reason I bought it. I felt that it would likely be one of the safest atomizers to use on mech mods with hybrid 510 connectors. Also included with the kit is the standard run of spare o-rings, a couple coils (no cotton), a set of hex keys, and a 510 drip tip adapter. Everything is tucked into a decent presentation box with a slide-out drawer holding all of the goodies. What makes me say that everything is wrong? The posts are too close together. There is only one hole per post (and we're all so used to Velocity now...). The deck assembly inserts through the top of the barrel. The barrel cannot be removed without taking the atomizer off of the device. The screws for the airflow... everything is just so weird. Finish 9/10 - I am getting a little bit of seepage around the base. This leads me to think that the tolerances are a bit off or the o-rings are a bit small or worn. Other than that, I find no flaws, and even that flaw is just a minor annoyance. Form 10/10 - Once the device is understood, its size makes some sense. Before, it might look a little tall. Even without a lot of branding this is an easy to recognize device. Function 10/10 - Again, once the learning curve is flattened out, this RDA performs flawlessly. I really like the easy adjustment of the air, and the ability to run a single coil. This RDA can almost be used as a nice mouth-to-lung device.